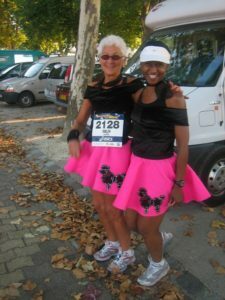 As Christa informed you Laurie and I were on the Marathon du Médoc course for a very long time; Laurie--6:10; Susan--6:35. However, as one of our friends said, "what clock---there should be none---it should be a fun run" because it's ALL ABOUT THE WINE. Yes, it's a measured 42.2 km course but---there are 20 wine-tasting stops along the way and, believe me, those areas get very congested and no one runs through them. The course goes through 55 vineyards and wine is served in plastic glasses; no paper cups here. There are water tables also but, again, it's ALL ABOUT THE WINE. This marathon promotes itself as the world's longest marathon---lots of detours to those wine tables. 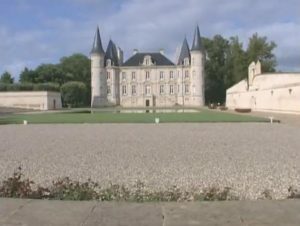 The course goes through the vineyards of the Médoc region. 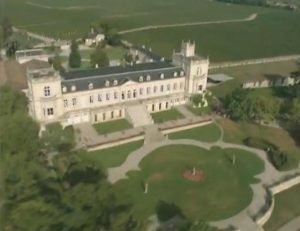 The scenery is breathtaking as are the chateaus. Much of the course is trail-running as well as patches of small stones. The latter make it almost impossible to run on. Thankfully, the last 5K is on asphalt. 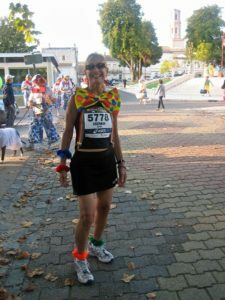 Almost everyone is in costume and there are lots of very creative runners out there. Laurie was a rock-and-roller in her gorgeous pink poodle skirt and I was a clown in my striped suspenders and big, big clown bow. BTW---when you cross the finish line you are presented with a bottle of wine, a decanter and a bag to put them in...amazing. Most runners attain their PW---personal worst---in this marathon. That's the best part of the experience. For anyone who needs a stress-reliever this marathon is the cure. If you want more info go to www.marathondumedoc.com. Thanks to all the MERMS who personally sent emails congratulating us. Our jet-setting experience was a fabulous one.